$22 daily greens fee w/ cart. $49 league entry fee per person. Open to the public 10-week recreation golf league Monday's at Elks Run this Spring! 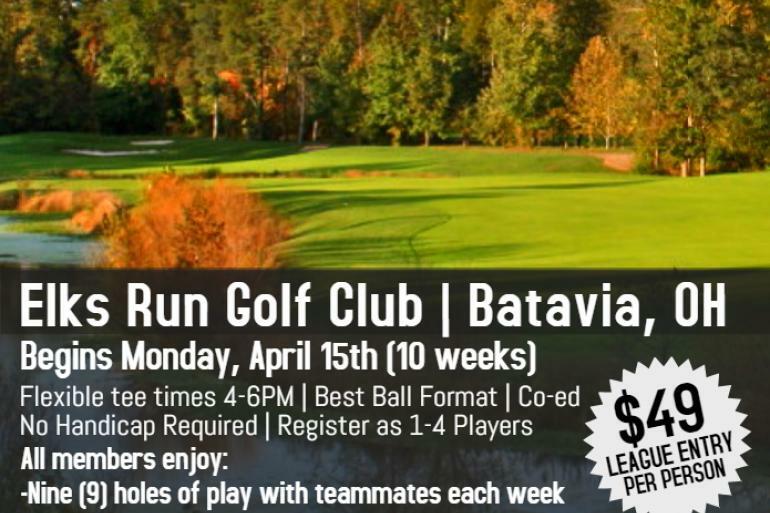 Twilight Golf Association (TGA) is hosting a 9-hole Best Ball Format league at Elks Run Golf Club beginning Monday, April 15th (10 weeks) with tee times available from 4-6pm. Register as 1-4 players. All league members receive a TaylorMade hat (Choice color) and play with teammates each week. Weekly contest holes and prizes to top team at the end of each season. Family restaurant and bar with entertainment. The Clermont Philharmonic Orchestra was formed during 1997 and presented its inagural concert in October 2, 1997 in collaboration with the 25th anniversary of UC Clermont College. A historic aviation museum dedicated to remembering those who fought for our freedom, and honoring those who made the ultimate sacrifice.